Photo by Manu Fernandez, Stephan Savoia/AP Photo. Have you two lost your minds? Both of you are suffering through long-running, self-inflicted public relations crises. Mark, Facebook’s self-serving and ever-shifting policies, the way its platform polarizes politics, and growing alarm about the health effects of social media, have turned you into a lightning rod. Elon, you are over a barrel for strange behavior, including attacking financial analysts, crying during a New York Times interview (which included the revelation that you use Ambien and recreational drugs), and tweeting yourself into a Securities and Exchange Commission investigation. Neither of your predicaments is really surprising, given the way the two of you combine planet-sized ambition with questionable management. What is puzzling is your failure to escape these crises. Why haven’t you taken advantage of the obvious, cheap, and proven way to launder your reputations and curry favor with the media? There’s no better balm for a billionaire’s press clippings than saving a newspaper. Exhibit A is Amazon’s Jeff Bezos, who was known for tax avoidance and cold-blooded ruthlessness in remaking the American retail landscape until he purchased The Washington Post for some loose change ($250 million). Despite being the world’s richest person—the sort of thing that used to make you a target of media types—Bezos is now described as a defender of democracy (“Democracy Dies in Darkness” is the Post’s Bezos-era motto) against the madness of President Trump. In California, Dr. Patrick Soon-Shiong is taking the reputation-burnishing possibilities of media ownership to the next level. Soon-Shiong has long received bad publicity—for questions about the drug business that made him a billionaire, for self-dealing in his philanthropic and cancer test endeavors, for a troubled L.A. hospital chain he bought, and for allegations of financial improprieties lodged by people including his brother and Cher. But then the good doctor rescued the L.A. Times and San Diego Union-Tribune from the clutches of a Chicago-based entity called Tronc. Now Soon-Shiong is being celebrated by hard-bitten reporters for restoring local ownership and investing in investigative reporting. Sure, buying a paper isn’t free, but it’s cheap for billionaires, and can even pay for itself. Soon-Shiong had to overpay—$500 million—to wrest the Times and the Union-Tribune away from their Chicago owners. But the purchase has provided him a valuable ballast of virtue that could reduce questions about his other businesses. In Boston, billionaire John Henry—who was educated in California, and built his investment company in Orange County—purchased The Boston Globe essentially for nothing, since he made back more than its $70 million purchase price by selling its headquarters land for more than $80 million. Likewise, owning the Post sure hasn’t hurt Bezos’s business. The state government of Maryland, which the Post reports on, has offered an astounding $8.5 billion in tax incentives to convince Amazon to build a second headquarters there. Of course, there are other rewards for buying newspapers, if you care: namely, that you’ll be doing a public service. Today’s newspapers are in deep trouble, struggling for revenue and constantly shedding staff. By buying papers, you two—if you’re willing to spend a little on the product—would provide stability to vital if weakened institutions that still try to get the facts and bind communities together. Think of the opportunity—you could do a good deed, and help your public image in the process. Now, to be fair, you’re still rich and famous and will face public scrutiny. And if you too blatantly deploy your newspapers to serve your other interests, you could run into trouble. (Soon-Shiong’s reported habit of using his philanthropy to serve his business ventures suggests that conflict with journalists at his papers is likely.) But once you own the paper you’re likely to be less of a target. Journalists have limited time and money to go after subjects; they’re not keen to devote precious resources to biting the hand that feeds. Of course, in that same letter, Cooper called you out for not dealing honestly and consistently with the Chronicle and other publishers, and abdicating your responsibility to improve the public discourse. The good news is that, by buying the paper, you could work with her to show your commitment to said discourse. It would be a chance to demonstrate that the days of “move fast and break things” are behind you. Since your press is even worse, Elon—your nasty habit of attacking reporters and suggesting you’d produce a rating system for journalists has predictably backfired—you’ll need to buy a tougher target: Digital First Media. That’s a newspaper group owned by Alden Global Capital, a New York-based hedge fund. You don’t have to buy the whole chain. It would be enough to grab the pieces of the chain from Southern California, where you live; this means everything from the Orange County Register to the Los Angeles Daily News. Alden, which has ruthlessly cut its staffs and newspaper offerings, is one of the few institutions with a worse reputation among journalists than yours. That’s good news for you. If you bought the papers and restored staffing and investment in the news product (maybe your Saudi buddies could help), you’d find yourself transformed overnight into a journalistic hero. And if the papers lose money, well, they’ll fit in well with other pieces of your portfolio, like Tesla, which still isn’t profitable. Yes, I know that newspapers are not the business you want to be in, but they still shape public narratives. 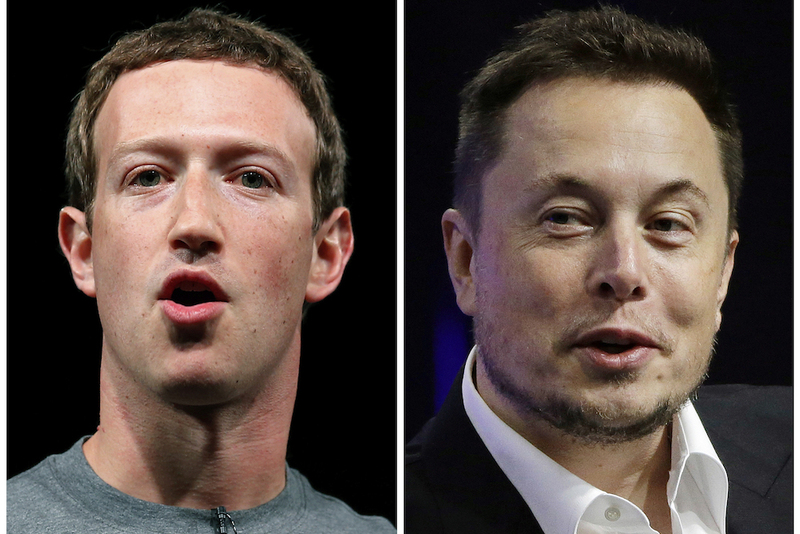 So, Mark and Elon, you face a choice. You can keep complaining about all the bad press you get. Or you can buy your own newspapers, and, in the process, give a boost to media and civic life in your own state of California. If you two are as smart as you’re supposed to be, your next moves are obvious.